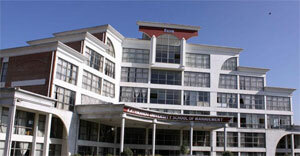 Established in August 1993, the School, popularly known as KUSOM, was the first school to launch graduate program in Kathmandu University and also the first one to initiate Master of Business Administration (MBA) program in the country based on internationally- followed design principles and structure. Twenty years on, the School continues to hold the prestigious position of being the leader business school in the country, rated as the best business school in all the B-Schools Ratings in Nepal to date and becoming the first choice of aspirants of management education and employers of management graduates alike (as indicated by the applicants to selectee ratio for its programs and the placement rate of its graduates over the years). The School is leading the way in management development of the country setting quality standards and innovative trends for other business schools to follow and its graduates providing high quality managerial, entrepreneurial and intellectual resources for the growth and success of a large number of business, development and academic enterprises in the country. The mission of the School is to improve the practice and profession of management for development through creating quality and relevant opportunities for learning, knowing, discovering, and applying the best in management. The vision of the School is to become one of the top twenty management schools in South Asia by 2022 while continuing to be the leader in management development in the country. · Continuous improvement in institutional performance and image. KUSOM leads the way in management development of the country guided by its motto Ahead in Management.